The female vampires try other means of persuasion and congregate outside, partially clothed or even naked, and shout him vile promises. I Am Legend was first published in 1954, but there is nothing dated about the story and it is a very entertaining read. The characterisation is good and the prose flows easily from one paragraph to the next, taking you on journey quite unlike any you will have been on before. 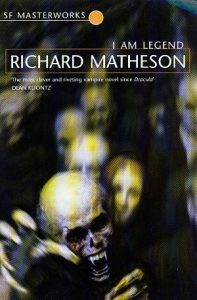 For reasons unknown at the beginning of the novel, every man, woman and child on the planet have been turned into vampires and it seems that only Robert remains unaffected. As the story unfolds the reader learns of the events leading up to the plague and Robert’s own theory as to why he alone was unaffected by the plague. There is also mention of the life that he has lost and of his wife and child. Ultimately, through Robert’s experiments on the vampires and on samples of their blood, the reader also learns the reasons behind the creation of this strange, new world. At just 160 pages I Am Legend is not a long novel, by today’s standards, but quantity isn’t everything and this is a truly great story.